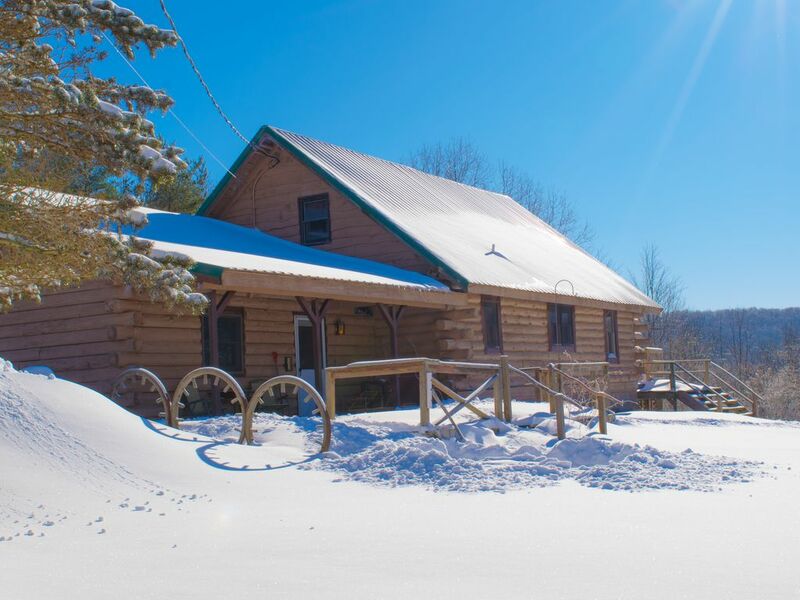 Fieldview - a Rustic Retreat Near Ellicottville! Stay and enjoy this newly-remodeled cabin in the woods! Just 5 miles from Ellicottville, this country retreat offers a true balance between rustic and modern. The property boasts spectacular views, cozy bedrooms, a spa-inspired bathroom, bar area, beautiful porches, a full kitchen, and comfortable dining area. A perfect escape for couples, families, or for that annual girl's weekend! Close to other nearby attractions like Seneca Allegany Casino, Allegany State Park and Holiday Valley! This cabin retreat is the perfect place to relax and take in nature. In the kitchen you will find a Keurig coffee maker, a variety of coffees and teas, and welcome snacks. Relax on one of two attached porches with a glass of wine or a cup of coffee. Telescope and binoculars are included for stargazing or animal watching. Whether you like quiet nights in, or a night out -- this location is ideal for either. The spa-inspired bathroom features a stand-up shower along with a claw tub for soaking. This property also includes a bar area with stools and tables. For safety, children should be supervised when using the stairs or when in the loft area. We stayed over a very rainy New Years eve with no snow so we missed out the beautiful outdoor experience, however the inside of the cabin was great. The seasonal decorations added a nice touch for the holidays. We loved the garage entry that allowed wet and muddy items to be away from the living space. The kitchen was well equipped and there were plenty of cleaning supplies available. The bathroom worked out for our group with plenty of hot water and towels for showers. The only negative (small one) that we encountered was the there was a single tuner box for the Satellite TV. So everyone in the house had to watch the same channel on all the TVs. There might have been a workaround for this but it wasn't something we were concerned about. Thank you for the feedback, Thomas! Thank you, also, for being great guests -- the cabin was left in great shape! Its a cozy space with room for everyone, minutes away from Holiday Valley. Thanks, Oak! Please come see us again! We had fun as a family at this cute Cabin,The owner Jessica was so sweet she made it work last minute and was so kind. The cabin sits all alone which is nice when you have 4 little ones from the ages of 1-8 it made it easy for Mama to enjoy Mother’s Day we will return and if your interested in this area this place is close to it all yet gives you the away and home vibe!